Taking the Farmall U concept to the next level, Pro specification tractors provide premium levels of comfort with outstanding versatility. With a 4 speed powershift, 32 ratio transmission there is always the correct gear for efficient operation in general duties on arable farms, tough tasks on livestock units, and daily farm business. Whether working with mounted machinery, trailed equipment, with a loader or on transport duties, versatile Farmall U PRO tractors more than live up to the reputation of the famous Farmall name. 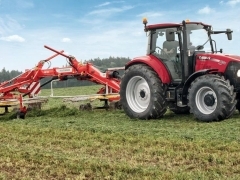 An extensive range of options including front loaders, front linkage, front PTO, additional hydraulic configurations and tyre choices means Farmall U PRO tractors will arrive fully equipped and ready to work. 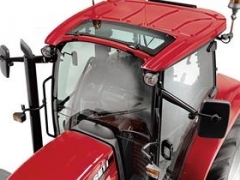 In addition, cab versions can be customised with performance monitors and ISO connector to enable data transfer between tractor and implement to suit the intended task. With a low noise level of just 72db (A), full air conditioning* and controls that are placed to ensure easy operation, the cab of the Farmall U PRO offers a superb operator environment. Easy-to-read, steering column-mounted instrumentation, cab suspension*, an easily adjustable and comfortable driver’s seat and a comfortable passenger seat that folds out of the way take the stress out of the longest working day. 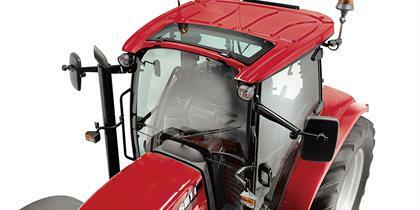 The Farmall U PRO cab features ‘surround’ vision from unsurpassed sight lines, courtesy of full-length glass doors, broad front and rear windows and an opening cab roof window for best-in-class loader visibility. The result is unobstructed views in every direction. Proven FPT engines with common rail fuelling technology and exhaust after-treatment meet Stage IIIB emissions legislation. They provide more torque and quicker acceleration, with constant maximum power available between 1,900 and 2,200 rpm. Farmall U PRO models are equipped as standard with an efficient, effective 32x32 four-speed Powershift transmission, with 40 kph Eco capability at 1,750 engine rpm. 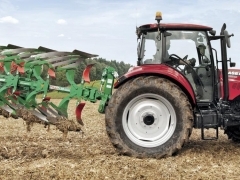 The power curve is perfectly matched to the 4-speed PTO (540/540E/1,000/1,000E), delivering the power required whatever task the tractor is charged with, from hay turning to heavy-duty power harrowing. 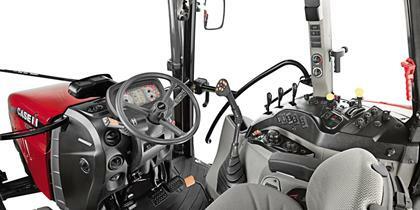 An EHC (Electronic Hitch Control) is standard. With a choice of up to four rear and two mid-mounted hydraulic remote valves, hydraulic flow can be directed as required to control a wide range of equipment. At the rear linkage, there is maximum 5,600 kg (OECD) of lifting power with two external rams. Choose either the standard pump for 60 l/min (OCLS) or the optional 100 l/min (CCLS) version for high delivery capacity. The Farmall U PRO is available loader-ready from the factory, complete with a loader sub-frame that includes rear axle reinforcement, electrical connector, electrical or mechanical mid-mount valves and quick coupler. A steering column-mounted shuttle lever makes for safe and predictable manoeuvring during loader work in farmyard or field and on tight headland turns. 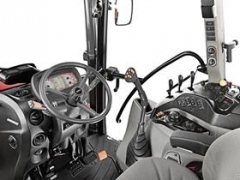 The new optional cab suspension system improves ride comfort, reduces operator fatigue and allows full productivity to be maintained throughout even the longest working day. With 59 mm of spring travel, the new Case IH system has been optimised to provide full suspension without increasing overall cab height.